Recover deleted or inaccessible files from hard drive and storage media. 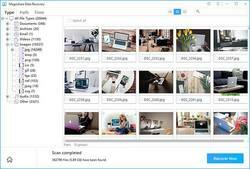 Magoshare Data Recovery 3.2 (Win&Mac) was available as a giveaway on January 14, 2019! 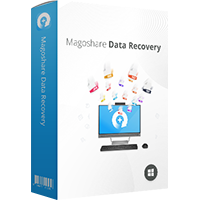 Magoshare Data Recovery is one of the most powerful hard drive data recovery software. It not only can recover deleted files, but it also can recover lost files due to format, reformat, erasure, logical error, hard drive crash, OS upgrade/reinstallation, virus infection, partition loss, unexpected power off access denied, and other unknown reasons. 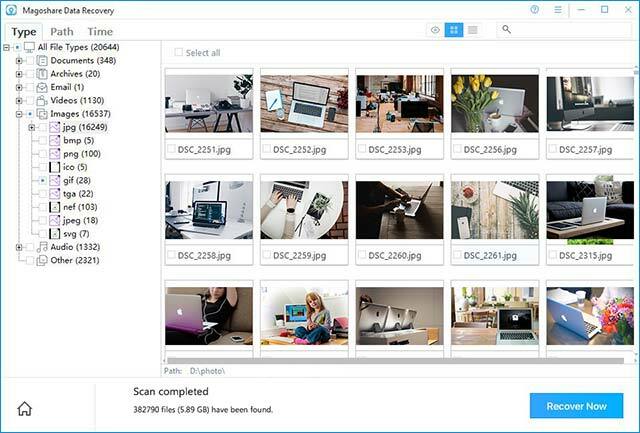 How would you improve Magoshare Data Recovery 3.2 (Win&Mac)? I did not have an opportunity to enter the new license code. Is it because I installed it over the previous 2.1 version? Just curious BUT how come it shows working back to Win2000 but NOT XP? Magoshare (www.magoshare.com) is reliable system utility software and data recovery software developer which is established in 2016, located in Shen Zhen, China. Once I read about the recovered data limitations I quickly uninstalled, free means free, no strings..
Had to disable VPN to register. Tried to run on a 4 TB drive, almost immediately closes after starting scan......every time. Fail. Last time I had a reason to use data recovery software, an older copy of the EaseUS app that I'd gotten from GOTD outperformed everything else, but that was tied to a copy of win7 I no longer use [new hardware], so I'll add Magoshare Data Recovery to my collection in case I need to recover files in the future. In that real world scenario, where I was actually trying to get back some files, the results from a half dozen recovery apps did vary quite a bit, though they all seemed close to equal in testing, so having several apps available that I can try if it's ever necessary, seems a good, logical strategy. 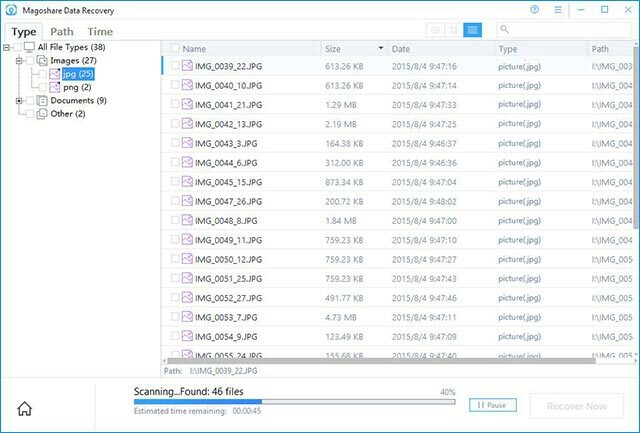 I do like that Magoshare Data Recovery lets you save the results of a scan, lets you pause scanning, & importantly, includes search -- when I recovered files, a few that I was after were stored in the wrong folders, so the ability to search for them turned out to be pretty valuable. 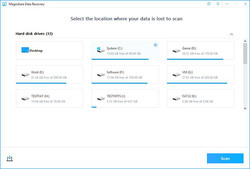 In general it's best practice Not to store any of your files on the Windows partition -- Windows only changes twice a month, so just 2 backups a month and you're pretty well covered. Then store your stuff in 2 or more places, and you should be OK -- if it's really valuable store copies off-site. In my case, where I'm storing very large amounts of data from large image files [e.g. 500MB each], I try to balance the inconvenience of copying the files I'm working on elsewhere, with the amount of work it would take to re-do my work editing those images. So if it would take say 1/2 an hour to copy the files, but only 15 minutes of work to get them current, I'll skip copying the latest versions. When I ran recovery software on the drive where those files are stored on this PC, it was to see if I could save the time it took to bring copies of those files current, and since it was a non-system drive partition, I could run the recovery software in the background while still using this PC. Doing it that way, I found that a very important criteria for recovery software was if it can be easily run in the background while doing something else. The often recommended Recuva was among the apps that failed that test. Last time I had a reason to use data recovery software, an older copy of the EaseUS app that I'd gotten from GOTD outperformed everything else, but that was tied to a copy of win7 I no longer use [new hardware], so I'll add Magoshare Data Recovery to my collection in case I need to recover files in the future. In that real world scenario, where I was actually trying to get back some files, the results from a half dozen recovery apps did vary quite a bit, though they all seemed close to equal in testing, so having several apps available that I can try if it's ever necessary, seems a good, logical strategy. 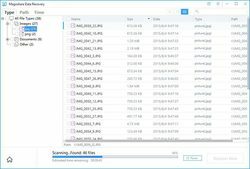 I do like that Magoshare Data Recovery lets you save the results of a scan, lets you pause scanning, & importantly, includes search -- when I recovered files, a few that I was after were stored in the wrong folders, so the ability to search for them turned out to be pretty valuable. 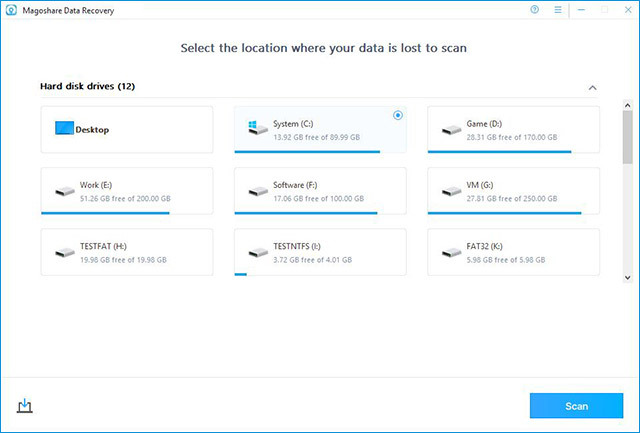 In general it's best practice Not to store any of your files on the Windows partition -- Windows only changes twice a month, so just 2 backups a month and you're pretty well covered. Then store your stuff in 2 or more places, and you should be OK -- if it's really valuable store copies off-site. In my case, where I'm storing very large amounts of data from large image files [e.g. 500MB each], I try to balance the inconvenience of copying the files I'm working on elsewhere, with the amount of work it would take to re-do my work editing those images. So if it would take say 1/2 an hour to copy the files, but only 15 minutes of work to get them current, I'll skip copying the latest versions. When I ran recovery software on the drive where those files are stored on this PC, it was to see if I could save the time it took to bring copies of those files current, and since it was a non-system drive partition, I could run the recovery software in the background while still using this PC. Doing it that way, I found that a very important criteria for recovery software was if it can be easily run in the background while doing something else. The often recommended Recuva was among the apps that failed that test. Downloaded and installed fine on a USB drive. Activated by clicking the key icon in the upper right and putting in the license code located in the README file. No time to test it now but a good thing to have in the arsenal just in case the need arises. Thank you Magoshare and GOTD teams. Thank you for including the license information. I am assuming it is "Lifetime license" with no version updates. Downloaded and installed fine on a USB drive. Activated by clicking the key icon in the upper right and putting in the license code located in the README file. No time to test it now but a good thing to have in the arsenal just in case the need arises. Thank you Magoshare and GOTD teams. Thank you for including the license information. I am assuming it is "Lifetime license" with no version updates. Hmm, since the description here on GOTD mentions it, files that really have been "erased" can't be recovered back. So using this term in form of a "Uneraser" or similar, mentioning it as action like a "unerase" feature within a program is pure marketing. If you for example "erase" (including shredding and/or wiping) a file or files from the hard disk by overwriting them with bogus data, the only thing you will ever be able to recover is just that, bogus data. And of what use could that be once recovered? It's a waste of time recovering "erased" data, except if you have a habit of collecting garbage data containing zero's and one's or maybe you like these numbers so much that you started to collect them. Or in other words, there is no such thing like "unerase" when it comes to data or maybe i'm just too picky here. Hmm, since the description here on GOTD mentions it, files that really have been "erased" can't be recovered back. So using this term in form of a "Uneraser" or similar, mentioning it as action like a "unerase" feature within a program is pure marketing. https://www.lifewire.com/wipe-vs-shred-vs-delete-vs-erase-whats-the-difference-2619146 If you for example "erase" (including shredding and/or wiping) a file or files from the hard disk by overwriting them with bogus data, the only thing you will ever be able to recover is just that, bogus data. And of what use could that be once recovered? It's a waste of time recovering "erased" data, except if you have a habit of collecting garbage data containing zero's and one's or maybe you like these numbers so much that you started to collect them. Or in other words, there is no such thing like "unerase" when it comes to data or maybe i'm just too picky here. OK I give up. Downloaded & installed. Found lic key in read me. But no place to enter it nor any menu items anywhere. I checked update & about but nope no Activate Button. Restarted 3 times still no activate button. Where do you check to see if it's activated? Click on the orange/gold key icon in the upper right. Hope that helps. Bob, Click on the orange/gold key icon in the upper right. Hope that helps. jboy, Thanks jboy, but just restarted program in case I missed the magic orange/gold key but nope nothing. I download & install almost every single program every day from GOD & been playing with computers since the TRS-80 days. Why can't a company make it easy & clear on how to register? I appreciate GOD & sometimes the wrapper licenses it while installing & sometimes you have to go to a web site and sometimes just click register to input the read me or email info you got. Here - nothing. So I "assume " it's registered but who knows? If you look at the first picture of the 3 above with the description. The top bar where there is the X to close it, etc. If you do not see an orange/gold key before those items, to their left, then I would try downloaded another copy. I am doing this from memory but I am sure it was in that general area. I empathize with your frustration about the various registration procedures but I believe that comes from the way the software is designed and out of the control of the GOTD site team. I hope this helps get you there! Bob, hmmmmmm, not sure why that is. If you did not paste in the license code, I cannot imagine it is registered. Unfortunately, the "About" does not say registered or not which is the normal way to check. That is a flaw on the software designer's part. (Are you listening Magoshare!) If you look at the first picture of the 3 above with the description. The top bar where there is the X to close it, etc. If you do not see an orange/gold key before those items, to their left, then I would try downloaded another copy. I am doing this from memory but I am sure it was in that general area. I empathize with your frustration about the various registration procedures but I believe that comes from the way the software is designed and out of the control of the GOTD site team. I hope this helps get you there! I could recover nearly 80 % of the files(JPEG and MP4) from unreadable SD card of Samsung phone. Rest recovered image files cannot be displayed by windows photo viewer. MP4 files cannot be played by Windows Media player/5K / VLC . How I can read/play these files? Umesh, Viewing photos, media playback is not possible because those files are partially overwritten with different data. For media, Windows says, "can not play the file because the file is damaged or the necessary codecs are missing". Can this program find programs, apps that were lost during recovery of pc? Mothman, Thanks for your o so informative response. The last comments seem to be at odds with reality because the Licence number for Activation is in the read me file. When activated it becomes a fully activated version. The last comments seem to be at odds with reality because the Licence number for Activation is in the read me file. When activated it becomes a fully activated version. Haven't been to GAOTD for a while. Downloaded Magoshare Data Recovery 3.2 zip file as directed. Began running the software on a partition with a known structure that was deleted in a partitioning operation. The software (still in progress) seems to be returning at least twice as many files as were on the partition. Meaning that each directory is listed 2 or more times, and some contain no files, while others contain 2 copies of the files known to be in the aforementioned directory(ies). Moreover, when I clicked on the "activate" icon at the top of the screen: (Thinking that as a GAOTD offer, using the "activate" icon will allow me to release the restrictions on the software and actually let me see it 'do its thing'. No such luck.) I found that I was expected to enter a license number, which I was able to get as long as I again agreed to pay $69.95. What function does GAOTD provide these days? I imagine I can download a ridiculously limited trial exposure to this software [as anyone may do, anywhere on the web, for almost any software] without the use of the GAOTD download gymnastics. Or, is this one of those offerings where once called on the limitations on what was presumed to be "free" software, we will then be told: Oh, that was an error -- here's the real deal! And it may be the "real deal"; or, it may be another 'inadvertent' difficulty; all of which is merely a tactic to limit the likelihood that anyone - not in constant contact with the supposed offer, & changes thereto - will become aware if anything is ever really offered. Seriously! When did the arena for promoting software, through the word-of-mouth between motivated users, become just another con to trick people into buying the hope of functional software. If it was a limited time trial I would almost find that acceptable. But when I can't even get it to do one complete job on one partition, as an evaluation; then I must ask not only: Why should I buy it? but also, Why is GAOTD allowing it to occupy space within its calendar? Yes, many such packages available on the web have limitations on their trial versions. But they are considerably less expensive, and they are available at any time, not on a: "Get it while it is available on a time-limited basis." kind of site. Haven't been to GAOTD for a while. Downloaded Magoshare Data Recovery 3.2 zip file as directed. Began running the software on a partition with a known structure that was deleted in a partitioning operation. The software (still in progress) seems to be returning at least twice as many files as were on the partition. Meaning that each directory is listed 2 or more times, and some contain no files, while others contain 2 copies of the files known to be in the aforementioned directory(ies). Note: There is a 500MB limit on what can be recovered, so my little 33 GB or so group of files will not be recovered. [The 500MB limit is due to the trial nature of what is offered in the download. If you want to exceed that 500MB value apparently you must pony up the full $69.95 list price of the software.] Moreover, when I clicked on the "activate" icon at the top of the screen: (Thinking that as a GAOTD offer, using the "activate" icon will allow me to release the restrictions on the software and actually let me see it 'do its thing'. No such luck.) I found that I was expected to enter a license number, which I was able to get as long as I again agreed to pay $69.95. What function does GAOTD provide these days? I imagine I can download a ridiculously limited trial exposure to this software [as anyone may do, anywhere on the web, for almost any software] without the use of the GAOTD download gymnastics. Or, is this one of those offerings where once called on the limitations on what was presumed to be "free" software, we will then be told: Oh, that was an error -- here's the real deal! And it may be the "real deal"; or, it may be another 'inadvertent' difficulty; all of which is merely a tactic to limit the likelihood that anyone - not in constant contact with the supposed offer, & changes thereto - will become aware if anything is ever really offered. Seriously! When did the arena for promoting software, through the word-of-mouth between motivated users, become just another con to trick people into buying the hope of functional software. If it was a limited time trial I would almost find that acceptable. But when I can't even get it to do one complete job on one partition, as an evaluation; then I must ask not only: Why should I buy it? but also, Why is GAOTD allowing it to occupy space within its calendar? Yes, many such packages available on the web have limitations on their trial versions. But they are considerably less expensive, and they are available at any time, not on a: "Get it while it is available on a time-limited basis." kind of site. Thank you. Rich, At the publisher itself, you can only restore something when you buy the program. Rich, the key is in the readme. Read it. Rich, I was having the same problem but i tried about 4-5 times and it just worked so just keep trying i guess. Rich, wow... thanks for the detail info. This kind of practices need to be stopped. Rich - an unfair comment. The 500MB limit is on the trial version. Once the registration code is entered, it turns into the full version, with no limit. Please all the experts tell is it REALLY true what Magoshare Data Recovery claims -that the software can restore ERASED files - i.e. unerase?? Robert, their own website does NOT claim they can recover ERASED files. Clerical error on the Giveawayoftheday page.